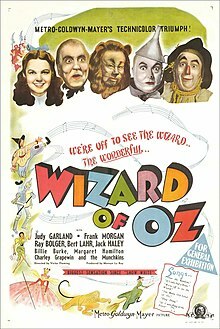 The Wizard of Oz is a 1939 musical film about a young Kansas girl cast into a fantasy world. Her efforts to return home are aided by three unusual companions, each with a quest of his own. Directed by Victor Fleming. Written by Noel Langley, Florence Ryerson, and Edgar Allan Woolf, based on the novel The Wonderful Wizard of Oz by L. Frank Baum. Music by Harold Arlen, Lyrics by Yip Harburg. 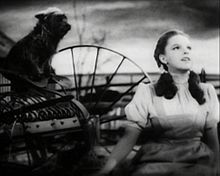 Someplace where there isn't any trouble... [tossing a piece of her cruller to Toto] ...do you suppose there is such a place, Toto? There must be. It's not a place you can get to by a boat or train. It's far, far away... behind the moon... beyond the rain. [Note: This line is ranked #4 in the American Film Institute's list of the top 100 movie quotations in American cinema]. [Note: This line is ranked #23 in the American Film Institute's list of the top 100 movie quotations in American cinema]. [last lines] Oh, but anyway, Toto, we're home – home! And this is my room – and you're all here – and I'm not going to leave here ever, ever again, because I love you all! And... oh, Auntie Em, there's no place like home! Be a lion, not a "mowess,"
Courage! What makes a King out of a slave? Courage! What makes the flag on the mast to wave? Courage! What makes the elephant charge his tusk in the misty mist, or the dusky dusk? What makes the muskrat guard his musk? Courage! What makes the Sphinx the Seventh Wonder? Courage! What makes the dawn come up like thunder? Courage! What makes the Hottentot so hot? What puts the ape in ape-ricot? What have they got that I ain't got? (Courage) You can say that again! Read what my medal says. Courage! Ain't it the truth, ain't it the truth! [Note: Bolded line is ranked #99 in the American Film Institute's list of the top 100 movie quotations in American cinema]. [last words; screams] You cursed brat! Look what you've done! [melts] I'm melting! Melting! Oh, what a world! What a world! Who would have thought a good little girl like you could destroy my beautiful wickedness?! Ohhh! Look out! Look out! I'm going! Ohhhh – Ohhhhhhhhhh! I AM OZ.... the Great and Powerful! Pay no attention to that man behind the curtain! The Great Oz has spoken! [to the Tin Man] A heart is not judged by how much you love; but by how much you are loved by others. [to the Lion] You, my friend, are a victim of disorganized thinking. You are under the unfortunate impression that just because you run away you have no courage; you're confusing courage with wisdom. Uncle Henry: Howdy, Miss Gulch. Miss Gulch: I want to see you and your wife right away about Dorothy. Uncle Henry: Dorothy? Well, what has Dorothy done? Miss Gulch: What she's done? I'm all but lame from the bite on my leg! Uncle Henry: You mean she bit you? Miss Gulch: No, her dog. Uncle Henry: Oh. She bit her dog, eh? Glinda: Keep tight inside of them. Their magic must be very powerful, or she wouldn't want them so badly. 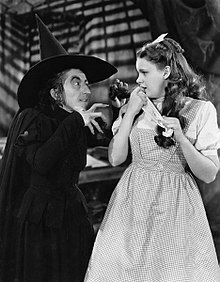 Wicked Witch: You stay out of this, Glinda, or I'll fix you as well! Glinda: Hohohoho, Rubbish, you have no power here, be gone, before someone drops a house on you too! Scarecrow: That's the trouble, I can't make up my mind. I haven't got a brain... only straw. Scarecrow: I don't know....but some people without brains do an awful lot of talking, don't they? Dorothy: Do – do you suppose we'll meet any wild animals? Dorothy: [noticing the horse drawing their carriage is one of changing colors] What kind of a horse is that? I've never seen a horse like that before! Coachman: No, and never will again, I fancy! There's only one of him, and he's it. He's the Horse of a Different Color you've heard tell about! Captain of the Winkie Guard: [After looking at the remains of the Wicked Witch of the West] She's dead! You killed her! Dorothy: I didn't mean to kill her. It's just the scarecrow was on fire. Captain of the Winkie Guard: HAIL TO DOROTHY, THE WICKED WITCH IS DEAD!!! Winkie Guards: HAIL TO DOROTHY, THE WICKED WITCH IS DEAD!!! Wizard of Oz: As for you, my galvanized friend, you want a heart. You don't know how lucky you are not to have one. Hearts will never be practical until they can be made unbreakable. Dorothy: Goodbye, Tin Man. Oh, don't cry! You'll rust so dreadfully. Here's your oil can. Dorothy: Goodbye, Lion. I know it isn't right, but I'm going to miss the way you used to holler for help before you found your courage. 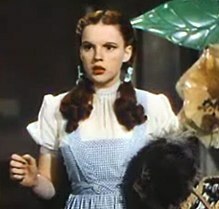 Dorothy: [to Scarecrow] I think I'm going to miss you most of all. The Greatest Picture In The History Of Entertainment! Biggest Screen Sensation Since "Snow White"! The Mighty Miracle Show That Is The Talk Of America! Amazing Sights To See ! The Tornado . . . Munchkinland . . . Horse Of A Different Color . . . Startling Balloon Ascent . . . Flying Monkeys . . . Trees That Talk And Throw Apples. Mighty Miracle Show Of 1000 Delights! It's a wonderful universal story. 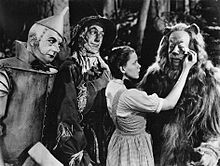 I mean you look at the Wizard of Oz — it takes a reality which is the beginning of the movie, and turns it into a mythology. … You know all great story telling is a form of myth. I would watch Wizard of Oz, like every day, when I was two. I had a hard time understanding that I couldn't go into the film, because it felt so real to me.